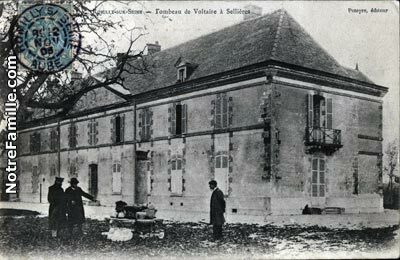 Rodama: a blog of 18th century & Revolutionary French trivia: Voltaire and the "Enigma of Sellières"
the remains of the chapel have long since disappeared. 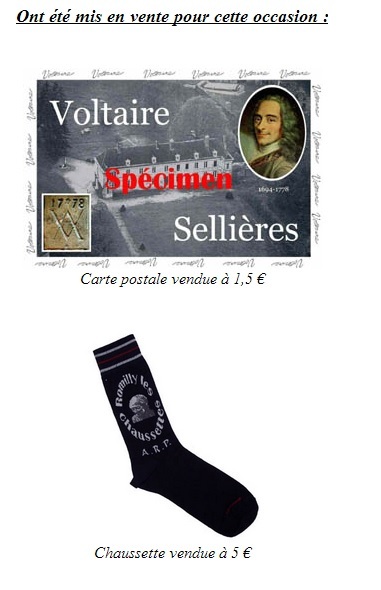 In 2004 there was game attempt to shine once more in the reflected glory of the great philosopher when the town staged an exhibition on "Voltaire and the Enigma of Sellières". Apart from displays of prints, plans and letters the main focus was the question of whether the exhumers of 1791 had really carried off the right corpse. In Champagne, we are told, doubts had long lingered. 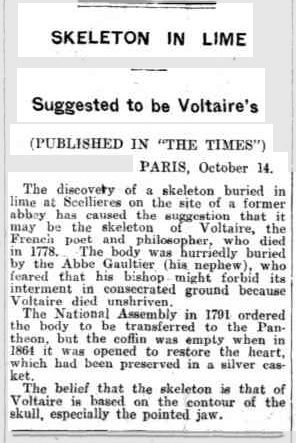 It was rumoured that Voltaire’s body had been secretly hidden inside a wall and some monk or gardener buried in his place, that the corpse, in its advanced state of putrefaction, had been dissolved in quick lime or, more sinister still, spirited away in the night by grave robbers – Freemasons or mysterious strangers dressed in black in the employ of the Empress Catherine the Great. Speculation had been renewed in 1927 when, in the course of renovation works, an unidentified body was found under the main staircase of the abbey house. It had no cross or rosary, an astonishing detail for a corpse interred within an abbey. The ribs of the skeleton were broken in a manner consistent with the removal of the heart and the marks of a surgeon’s knife were also visible on the skull. The conclusion was plain – this was Voltaire himself, swapped with the gardener to ensure he rested in peace. At the time the find caused a flurry of comment in the press as far away as Australia. In 2004 it didn't excite much interest. Further details from an accompanying book by local historian Pierre Guillaumot can be found in Biblionomadie et Voltaire by Eric Poindron, 24 November 2008.